File image of Stanford University. 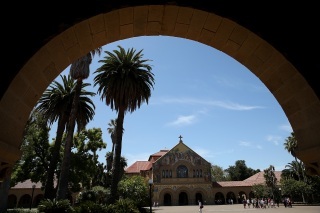 In a meeting Thursday with a coalition of students and campus workers, Stanford University President Marc Tessier-Lavigne declined to officially declare the university a "sanctuary campus," according to a campus spokesman. Members of the student group Stanford Sanctuary Now, who also go by SSN, met with Tessier-Lavigne in his office to urge the university to not share student and staff citizenship information with U.S. Immigration and Customs Enforcement and the FBI and to declare the school a "sanctuary campus." According to university spokesman E.J. Miranda, Tessier-Lavigne explained to the group that the term sanctuary is not well-defined, and that it could be detrimental to students and employees to use such a label, putting them at risk of federal sanctions. Additionally, Miranda said that Tessier-Lavigne noted that none of Stanford's peer institutions had declared themselves sanctuary campuses. The term "sanctuary campus" is modeled after sanctuary city, which is any municipality that has adopted policies to protect undocumented immigrants. Miranda said that Stanford is deeply concerned about the potential impact to individual members of the community, and to the academic mission of the university amidst the possibility of immigration restrictions under President Trump's ban on travel from seven predominantly Muslim countries. SSN member Emma Hartung said that while she was happy with Tessier-Lavigne for reaffirming shared values, she was really hoping for more concrete actions. "Essentially, I think the president didn't express willingness to commit to specific further action, and we're really pushing for the university to be a leader in the campus movement to adopt sanctuary and extend that to students and anyone employed," Hartung said. Frankie Preciado, executive director of SEIU Local 2007 said that he supports the efforts from SSN, and that a sanctuary campus is a priority for his union. "We are committed to supporting workers and their families in the struggle for social justice, irrespective of immigration status," Preciado said. University officials said Stanford would continue to actively engage in addressing questions and providing resources to the community.